THE people of Tacloban City and other parts of Leyte will ask for Pope Francis’ prayers for the safety and protection of the Filipino people against future calamities. This was according to House Independent Minority bloc leader and Leyte Rep. Martin Romualdez as he announced that Tacloban City is primed for the coming of Pope Francis today. Pope Francis is expected to arrive in Tacloban City today to celebrate Mass with the survivors of typhoon Yolanda. After the Mass at the Daniel Z. Romualdez Airport, Pope Francis will travel to Palo, Leyte to have lunch with the families of victims of the deadly typhoon that hit the country last November 8, 2013, as well as with the families of the victims of the earthquake on October 15 the same year. “It’s all systems go for the visit of Pope Francis in Tacloban City and Palo, Leyte,” Romualdez said, as he assured that local officials are ready for any risks to the Pope’s safety and activities in Tacloban City and Palo. “Whether it’s the possible effects of typhoon ‘Amang’ or threats to the Pope’s safety, we are prepared for everything,” Romualdez added. Romualdez said Leytenos will join Pope Francis in praying for the immediate and total recovery of survivors of super typhoon Yolanda and other major calamities like the intensity 7.2 Bohol earthquake. Aside from protection from the adverse effects of climate change, Romualdez also said that they will ask the Pontiff to pray for national unity and permanent peace. Likewise, they will seek guidance for government leaders on how to truly serve the people and to forget the politics of vengeance and hate. “Let us not forget that even if the Pope’s primary purpose in visiting our country is to be with the survivors from ‘Yolanda’, he came to pray for all of us, for our national salvation from the trials we’re now facing,” the solon said. 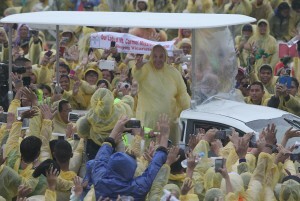 Romualdez emphasized that Pope Francis is the representative of God to the Filipino people. “He’s here to help us plead directly to God for forgiveness. “We don’t know if we will ever have this heavenly opportunity again. So let’s not waste it. With the trying times we live in today, we need God’s mercy more than ever,” Romualdez stressed.